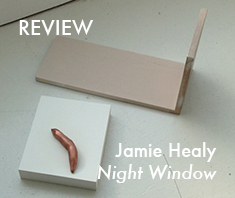 Jamie Healy, “Night Window,” 2014. Courtesy of the artist and n/a. What at first seems like a barely legible arrangement of objects* begins to reveal itself as carefully considered poetry as one moves through Jamie Healy’s exhibition at n/a. 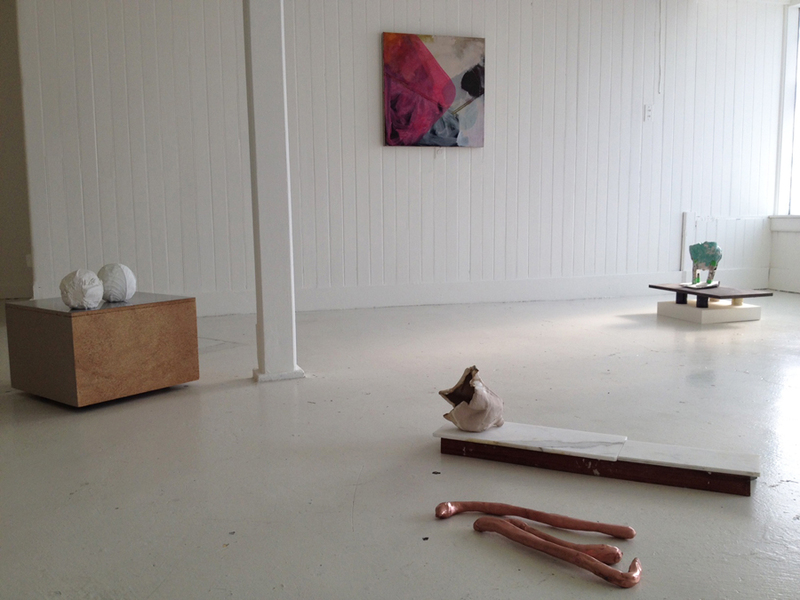 Sculptural forms and paintings are dispersed sparingly around the room, on the floor, on pedestals, propped against the wall, and hung at eye level and above. A neon form rests on the bed emanating a sleepy green light. 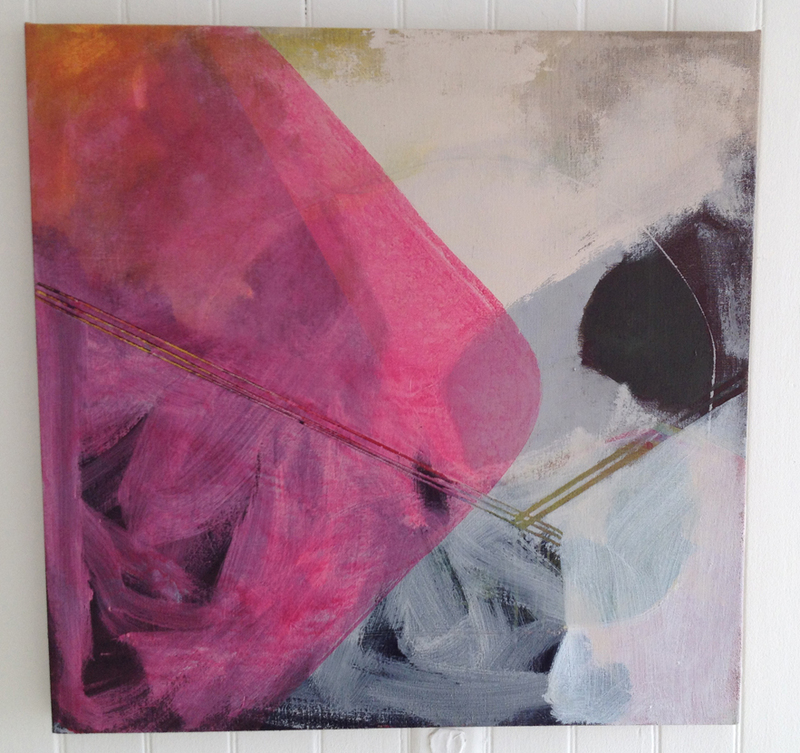 The works evoke feelings and suggest ideas through their formal and material qualities as well as their shifting relationship to one another and the space. Many of the pieces appear unfinished or roughly made, reflecting traces of the artist’s hand and the process of construction. A plaster-filled latex mold, held together by clamps, is presented on a rather elaborate pedestal in one of the gallery’s bay windows. 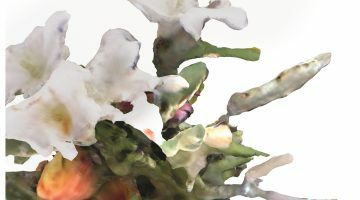 The lumpy, splattered form evokes empathy as well as curiosity. What’s being cast inside is unknown. 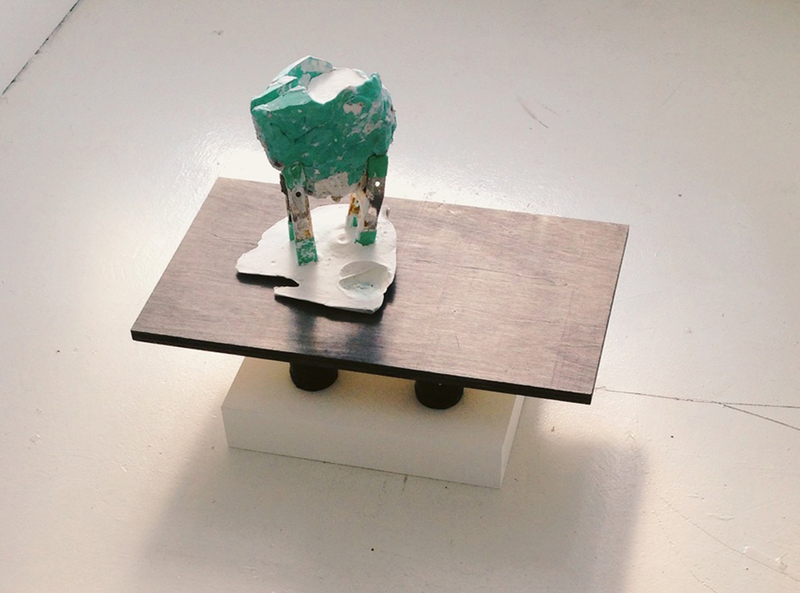 Rather, the casting process itself, the form its tools take, is put on display. Such works prompt us to question the emphasis we place on finished products over process, formulated concepts over experience, themes that seem central to Healy’s practice. Healy intentionally plays with such value systems, inverting expectations through her presentation strategies and material choices. 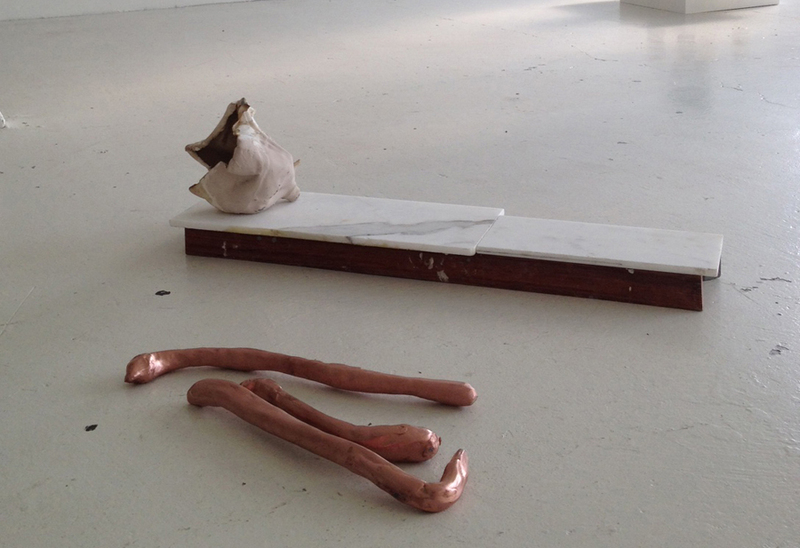 For instance, an open, shell-like form resting on a marble platform is actually a used latex slip, detritus of the art making process. The brownish residue inside makes it seem slightly bloodied and vulnerable. Lying next to this piece, several rough-hewn, tubular forms have an abject quality, which is heightened by their position on the floor. The pieces are made of porcelain, somewhat ironically given that they look bodily, intestinal, or even like excrement. Each is carefully squeezed and shaped by the artist’s hand and then painted to appear as though made of copper. 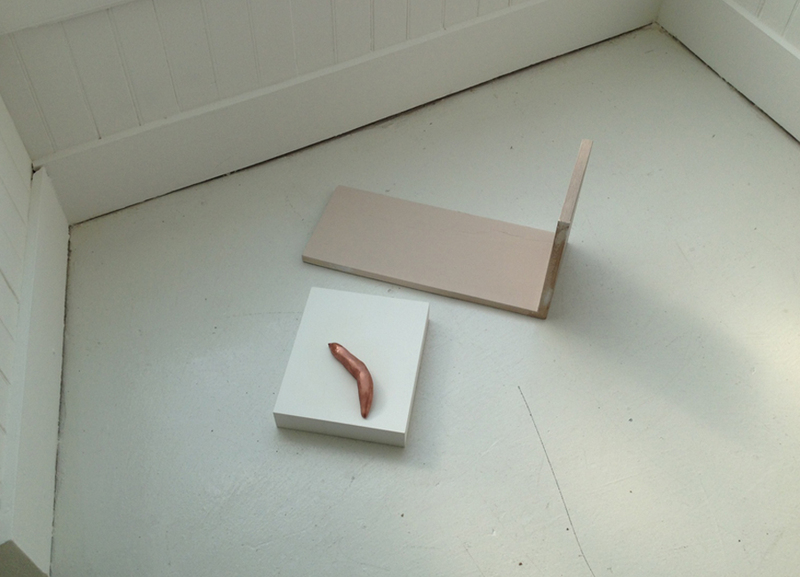 Other more directly excrement-like forms appear throughout the exhibition including another painted porcelain shape presented on a pedestal in the gallery front window. 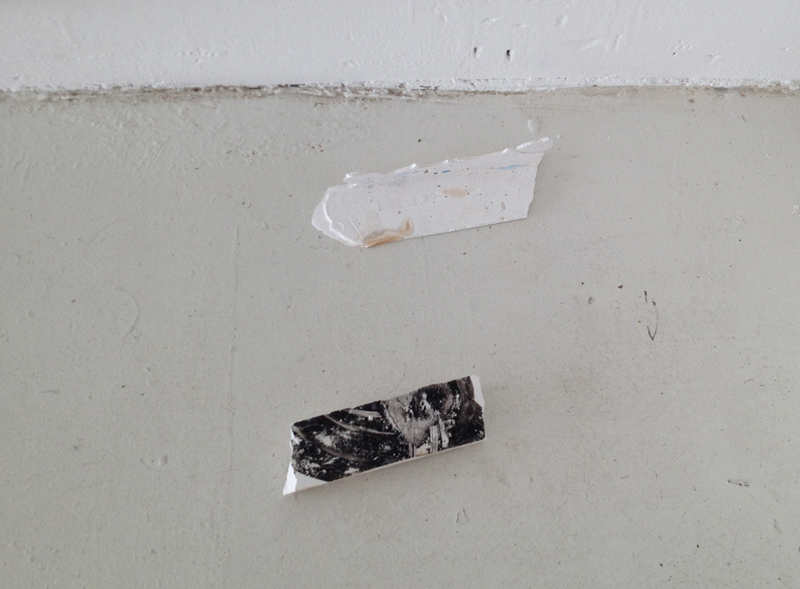 This attention to the undervalued or non-privileged is perhaps more poetically expressed and pushed furthest by two small plaster pieces in a corner, which one could easily mistake for architectural debris. A central concept for Healy is having her work operate as a kind of language, where each object is like a word and each group of objects operates in a kind of conversation—but one that shifts with relation to other objects, the space, and the viewer. Recognizing the failure of language to fully express or convey meaning, primarily because it relies on binary systems of value, Healy seeks to open up gaps, where a wider range of possible experiences, interpretations, understandings, etc. is possible. This complements n/a’s mission as a space dedicated to queer ideology nicely because it is in such gaps that a wider variety of identities can also be expressed. While these ideas are conceptually engaging, what ultimately feels most compelling about Healy’s installation is the visceral quality her objects evoke and the way that they suggest and implicate the body. Highly reduced, yet unmistakably present, their rough-hewn, cast-off qualities suggest frailty, vulnerability, and even humble assuredness as they take their places within the exhibition, be it on the floor or awkwardly presented on pedestals. 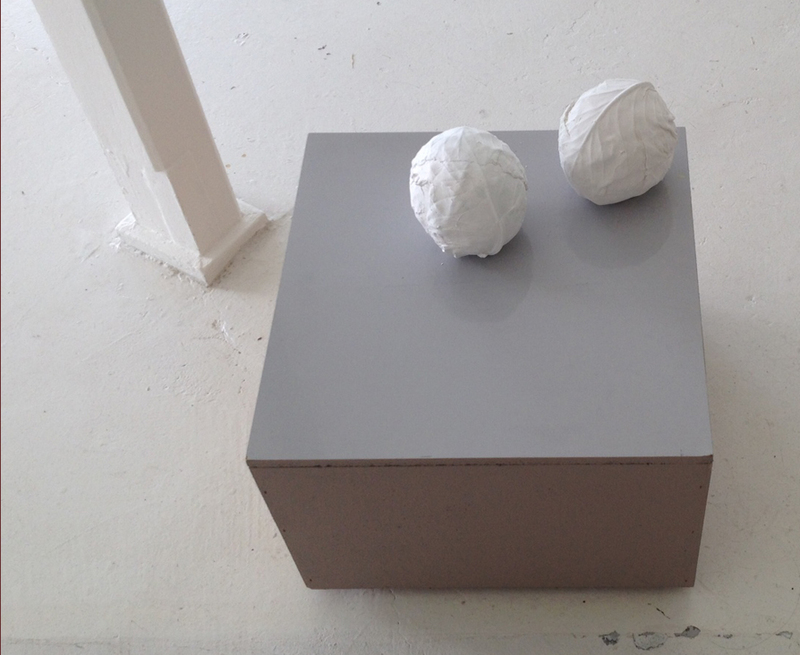 There is something moving, for example, about two coarsely cast plaster cabbages sitting together on the largest pedestal in the room, slightly out of place yet asking for recognition. While several smaller paintings around the room were nice on their own, they seem secondary and less visually and conceptually interesting than the installation of objects on the gallery floor. An exception is a painting hung at eye level in a central area of the gallery. The most colorful and traditionally beautiful object in the room, the painting consists of transparent washes of pink, white, and grey, simultaneously saturated and suffuse. A dark shape is counterbalanced by a large pink triangle. Aside from being visually pleasing, there seems to be a parallel between Healy’s mark making within the field of the canvas and her arrangement of objects—gestures within the spatial field of the gallery. Both form a kind of language that suggests rather than fully articulates ideas, highlighting a kind of fluid and indeterminate space and inviting the viewer to remain attuned and open. *Note: Healy often rearranges objects throughout the course of an exhibition to emphasize the fluidity of relationships and meaning. So, if you visit n/a you are likely to encounter a different presentation from what’s described here. For more information about the show, visit n/a. 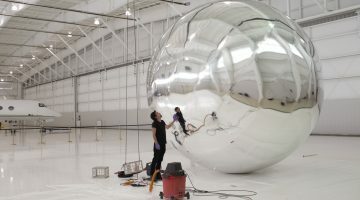 SFAQ Review: Chris Duncan: “Aspects of Light” performance at Shapeshifters Cinema, Oakland. November 10th, 2013. Previous post SFAQ Pick: "Week-End à Rome" featuring Martine Bedin and Mai-Thu Perret at Fondation Speerstra in Apples, Switzerland.